Where did Region 8 begin? The Reformation Prayer Network is a prayer movement for igniting a holy reformation in every sphere of society. 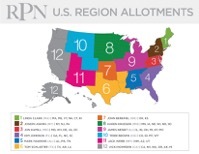 RPN is building a network in all fifty states of the United States for each of the seven mountains and also among local churches, children, youth, and intercessory worshipers. RPN and Generals International identify each state and have a state General who leads large groups of intercessors throughout the states to pray as one. The Minnesota Prayer Network is linked to both HAPN and RPN as National Prayer Networks. Just as the state of Minnesota is broken into 4 regions (North, South, East and West) to help us communicate & coordinate prayer, the United States has been broken up into 12 Regions to help us communicate & coordinate prayer. What states are in Region 8?